Posted March 10, 2010 by Jason Gill & filed under Developer Blog. It seems that Marketing and IT departments are always at odds. Having worked for a substantial amount of time in each division, I have come to my own conclusions as to why this is the case. I believe there is a misperception as to the root cause to the problem and I believe that I have a solution. The difference is this: Marketing wants things done fast, IT wants things done securely, and neither trusts the other because of it. Yep, it’s that simple. Marketing departments need to be more security minded, to the point that IT trusts them to have access to the stuff they need. IT needs to figure out how to deliver on the fly, to the point that Marketing trusts them to be tasked with something. If this were to happen on a global scale–if Marketing were security experts and IT were lightning fast–it would create world peace. I’m sure of it. Posted March 3, 2010 by Jason Gill & filed under Developer Blog. Often I just want to take my Blackberry Curve and throw it through the window. Why? Because it has a freaking track ball. Whoever thought a track ball was a good idea on a device that becomes as unresponsive as the Blackberry, should be stoned to death (or maybe they were just stoned at the time?). The reason this has become so frustrating to me is because of the slow processor. Yeah, it’s a small device and I can’t expect it to be a super computer, I get it. But if in the moment that it becomes unresponsive, even for a fraction of a second, I happen to be using the track ball for any reason the results are often disastrous. You see, as I scroll through options, and land on the one I want, for example “yes” instead of “no,” and then I click the button, sometimes I actually scrolled too far and actually click “no.” But I don’t know that until it becomes responsive again and “catches up” and suddenly the wrong option is highlighted and clicked before I can do anything about it. This doesn’t take a huge delay to cause problems (though huge delays are common). When “no” gets selected instead of “yes” or vis-versa, or whatever I’m trying to use the track ball for, I get really frustrated. And it happens that I get frustrated a lot throughout the course of the day. Hence my frustration becomes anger. Yes, my phone makes me angry. I’d really like to replace it, but it’s the only one my company will pay for me to have, and my anger ain’t worth the money. All I can do is shake my fist in the air and long for better days when my smart phone had a touch screen. Posted January 28, 2010 by Jason Gill & filed under Developer Blog. I have to say, I’ve been nothing but impressed with UDOT’s use of Twitter. Not only are they constantly and consistently updating us on road closures, serious accidents, and construction progress, they are also very responsive and helpful to individual requests. For example: Back in July, I was stuck in traffic—more specifically, at a dead stop in traffic. I whipped out my phone and sent a tweet to @UtahDOT asking them if they could give me a reason. I’ll be honest, I really didn’t expect a response, but within minutes I got my answer. Fast forward to last week. My wife and I were complaining about the fact that no one was merging properly at the end of the new lane added to Highway 201 last year. People weren’t even attempting to merge until the lane had already ended and it was starting to annoy us. One day on the way home from work, I paid close attention and discovered why people were so slow to react: the road sign indicating a merge was place exactly where the lane ended, giving drivers little to no time at all to start merging in advance. So, when I got home I sat in my garage and sent out another tweet to UDOT, this time with a complaint rather than a question. I did not get an immediate response this time, however. UDOT went to work on the problem and informed me via Twitter the solution to the problem once it was already in motion! I was beaming the rest of the day after their latest response feeling like I had made a difference in the world. The credit is not all mine, however. Twitter has changed the world. And UDOT deserves a shout out for putting it to good use! Thanks, UDOT. Posted January 25, 2010 by Jason Gill & filed under Developer Blog. I’ve been using FireFox as my primary browser since version 0.9 and have admittedly grown quite attached to it. On the other hand, I’m quite fond of Google as well, so the prospect of making the switch to Chrome seemed almost inevitable as FF continues to grow into a resource heavy machine. The first deterrent however, was the lack of extension support in Chrome. The main reason I love FireFox (or so I though, as you’ll see in a moment) was for the extensions that make my day to day so much easier and that I cannot live without—such as Web Developer Toolbar, XMarks, AdBlocker Plus, pdfIt, and more. Now that Chrome supports extensions, I really thought I was making the transition. I installed many extensions, and got Chrome to the point where I really felt like I could use it on a daily basis to accopmlish my tasks. It loads much, much faster and I thought I was in love! To my surprise, however, there are many nuances in Chrome itself that I feel make it lacking enough to the point that I cannot use it, in spite of extension support. In other words, I have complaints about the browser itself, not about the lack of extension support. These are things that extensions might possibly fix at some point, but I feel they belong as part of the browser’s base. Hopefully Chrome adopts many of these seemingly simple features as it graduates from Beta and beyond. “View Background Image” – While Chrome does have support for viewing a forground image in a seperate tab, I need the ability to view a background image. It’s a feature I use a lot in FF. “View Selection Source” – I understand the advantage of using the “Inspect Element” feature in Chrome, but the behavior is something quite different. I love that FireFox will show me only the code I’ve selected and highlights it in the popup window. Customization support – Simply plugging “about:config” into the FF browser offers a vast amount of customization settings. Enough to let you really screw things up if you aren’t careful. As of yet, all I’ve seen in Chrome is the ability to set a few startup switches. A perplexing inablility to use Google Bookmarks in a meaningful way – So I can synchronize bookmarks across browsers, fine…but where do they get stored if not in Google Bookmarks? Even extension support is weak at best. Bookmark dividers – I’m an organization freak, what can I say? Good visual representation when the word you are searching for cannot be found – Chrome simply says “0 of 0” where FF changes the box to red. I’m sure I’ll find more with time. These came about in a matter of a couple of days. What about you? Have you found yourself having a hard time making the switch as you develop or use Chrome in your day to day? If you’ve found things in Chrome that you wish Firefox had, please share those as well. Posted January 8, 2010 by Jason Gill & filed under Developer Blog. This year I participated in Movember. It’s a fundraiser for Prostate Cancer Foundation benefiting Livestrong where you basically start clean shaven on November 1st and proceed to grow a Mo (slang for mustache). The mustache helps give a reason to talk to friends, family and anyone else you talk to about Movember. You sign up on the website where you are given a donation page (MoSpace). The people you talk to can go to your MoSpace and donate money. I was talked into participating by a co-worker. I had never grown a mustache before so I’ll admit, I was looking forward to having an excuse to find out what it looked like. I had a goatee for the previous 6 years, and was pleasantly surprised how well it grew and how much I liked it. Even though my wife is adamantly opposed to me having a mo, I accepted the challenge. It turns out, facial hair is not facial hair. While my goatee was a good idea, the mustache was certainly NOT. Not only did it take the first 3 weeks of November to even be visible, but once it came in it was sparse and downright creepy looking. 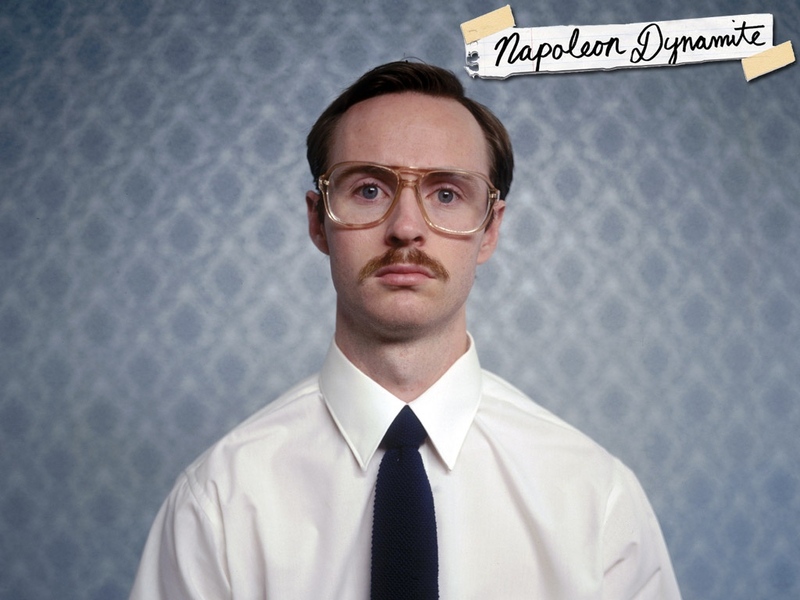 Think Kip from Napoleon Dynemite, but worse. To top that off, any kind of flash photography was enough to wash it out to where it wouldn’t show up in pictures when I wanted to post my progress on Facebook or my MoSpace page. I guess a lame mo constitutes lame donations. I raised all of $26 for the cause and $5 of that was my own donation. Next year I think I’ll just find someone who’s participating and donate $26 to their month and be done with it!